Finally! Funally! - Stop staring and start sewing! 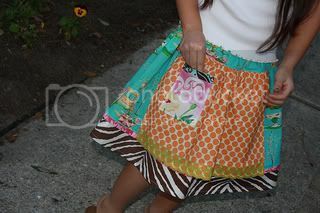 The winner of the Darla scraps and cute towels is Kristie who said "I love that fabric! So fun!" at 9:19 on 1/17. Congratulations Kristie!! I need your address! I'm finally done with my latest skirt pattern! I'm so sorry it took so long but I wanted to be completely happy with it and I am (I think). I was not happy with the pictures and so I spent last weekend re-making it while taking much clearer pictures (for the 3rd time!). 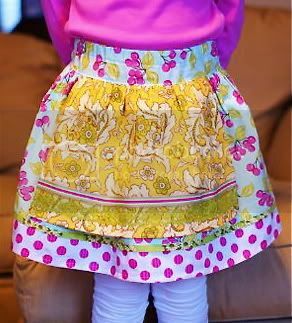 I sent it out to my testers who did a wonderful job of going over it with a fine tooth comb and creating skirts (and even testing the included "sleeve ruffle" instructions) that were beautiful and unique. Thank you testers!!! 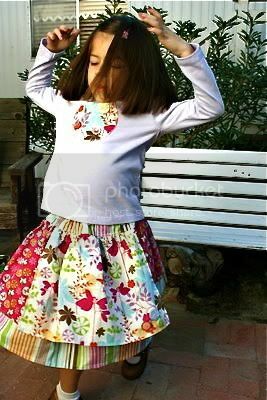 Here is Kelci's daughter Bella, giving it a trial twirl. This is a very important part of the pattern testing. A skirt with good aerodynamics is always a huge hit! Kelci is a bag maker extraordinaire so check out her stuff on etsy! And here is my friend Kelly's version of it (I believe those are Erin's knees). Her daughters are tall girls so she added the tights under it (plus she lives in a cold climate). I think the tights are a great idea fashion-wise too! Darling (and a little bit funky)! Kelly does a meticulous job on checking my grammar (things like "you're" instead of "your", which is a huge pet peeve of mine) and I think she should consider being a book editor or something along those lines! And here is Marie's version. 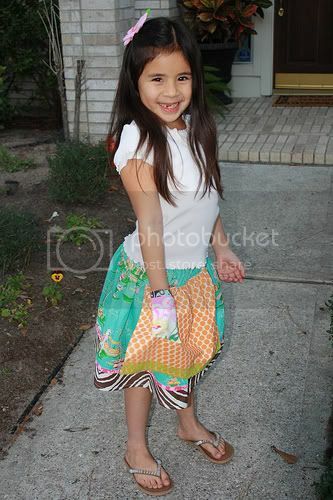 Her big girl Isabella did a great job picking some fun fabrics and she's putting that pocket to good use. I just love the orange dots for the apron (so spunky!) and the zebra stripes are brilliant. I think Isabella has "the knack". So I've decided to name this skirt Evelyn because I like it and it's a family name like Edith. I decided against Ethel (Edith's twin sister) because every time I said the name I could hear The Streak by Ray Stevens and him yelling "Don't look Ethel!! But it was too late. She'd already been mooned." Sorry. I'm so glad to be finished and I'm not going to tease you by telling you I'm already working on the next one (even though I am!). I'm going to have a drawing on February 14th amongst all the people who have purchased the Evelyn Apron Skirt pattern and the winner will get a 50.00 gift certificate to Fabritopia (I'll pay shipping!). Fun (and I'll have tons of new stuff by then)! I just found out the Oh Cherry Oh has shipped so I should have that by Monday and I've ordered 27 bolts of Wonderland (a big apology to those who wanted the Mary Engelbreit line)! Thank you all for helping me decide! And a big thanks for the well wishes on my Dad's 70th birthday! I think he had a nice day and he's got a lot of fun things planned for the next 30 years (should be good)!